Poor oral hygiene. Plaque buildup is the primary cause of gum disease. When life gets busy, we may be less diligent about our oral care. This allows bacteria in the mouth to form a biofilm (plaque), which causes inflammation of the gums. Heredity: Some people are genetically more predisposed to gum disease. Look at your family history. Have any of your relatives had gum disease or lost their teeth? Pregnancy. 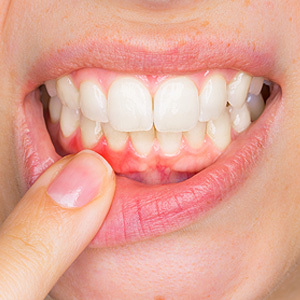 Gums are sensitive to hormone fluctuations, and it is not uncommon for pregnant women to experience an inflammation of the gums known as “pregnancy gingivitis.” Gingivitis — characterized by red, swollen gums that bleed easily — is the beginning stage of gum disease. Age: The chance of developing gum disease increases with age. Over 70% of Americans 65 and older have periodontitis, an advanced form of gum disease, according to the U.S. Centers for Disease Control and Prevention. This may be influenced by other diseases, medications that cause dry mouth, or other causes of plaque buildup. Diet: Eating too many simple carbohydrates (those found in sugar, white bread, white rice and mashed potatoes, for example) is linked to chronic inflammation in the body, which increases the risk of gum disease. Smoking: Smoking is a significant risk factor for the development and progression of gum disease. Since nicotine constricts blood vessels, smokers may not see the typical symptoms such as red, puffy, bleeding gums, so the disease may cause damage before smokers realize there is a problem with their gums. Diabetes: Uncontrolled diabetes puts you at higher risk of periodontal disease. Not only can diabetes make gum disease worse, gum disease can make diabetes symptoms worse. Our aim is not to scare you but to help you become aware of factors that can increase your risk of gum disease. Many of these factors are not under your control. However, you can do your part to prevent gum disease by staying on top of the things you can control. Let us know about any new medications you are taking, eat a balanced diet rich in complex carbohydrates and other nutrients and, if relevant, manage your diabetes and explore programs that will help you quit smoking. Fortunately, good oral hygiene and regular professional cleanings can turn early gum disease around, so if you have any of the risk factors that contribute to periodontal disease, be extra diligent about your oral hygiene routine. And make sure you come in for regular dental checkups and cleanings. If you show signs of gum disease, we may recommend that you come in for more frequent cleanings.